In today’s digital world, the messaging and texting that have become a prominent part of most people’s lives are a form of asynchronous messaging. These are a simple, convenient method of communication for people on the go, with varied time in response based upon intrigue and urgency. Asynchronous messaging has become so ingrained in consumers’ lives, an expectation has evolved that businesses should be able resolve issues just as quickly and easily, and on the customer’s timetable. 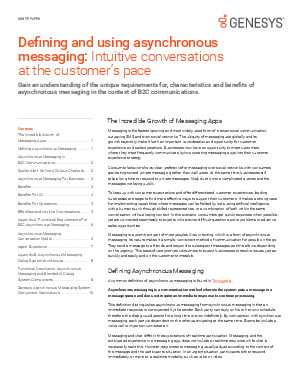 To keep up with consumer expectations and offer differentiated customer experiences, there is a strong case for implementing capabilities where messages can be fielded by bots using artificial intelligence, with a human touch through skilled representatives, or a combination of both within the same conversation, without losing context.